Comprei este bronzeador da Lancaster no ano passado e durou-me aproximadamente um ano (talvez um pouco mais e tudo). Isto é incrível porque eu, nessa altura, usava este produto 5 vezes por semana sem falta! Gostei muito deste bronzeador porque, embora no centro tenha brilho, o resultado final é mate porque o brilho é muito subtil. O bronzeador chama-se Matt and shine sun powder e a minha tonalidade é a 201. A embalagem é extremamente sólida , bonita e ,fechada, parece que imita o sol no centro. I bought this bronzing powder from Lancaster a year ago and it lasted me about a year (maybe a little more than that). This is amazing because at that time I used this product five times a week every week. I really enjoyed this bronzer because, although the center has shimmer, the end result is matte because the shimmer is very subtle. The bronzer is called Matt and shine sun powder and my shade is 201. The packaging is extremely strong, beautiful, and when closed, it seems to mimic the sun in the center. Comprei este bronzeador numa emergência (precisava dele naquele dia) e a loja não tinha marcas que eu conhecesse. Acabei por levar o bronzeador da Lancaster e desembolsei 20 euros. Adorei e já comprei uma segunda embalagem ( o preço aumentou poucos euros entretanto)! Quando olhei para a embalagem vazia não a consegui deitar fora. E por outro lado, tinha um batom da Rimmel que odiava. Juntei o útil ao agradável e transformei o batom em blush! I bought this bronzer in an emergency (needed it that day) and I didn't know the brands at that store. I ended up taking the bronzer of Lancaster and that costed 20 euros. I loved it and already bought a second pack (the price increased a few euros though)! When I looked at the empty package I could not throw it away. 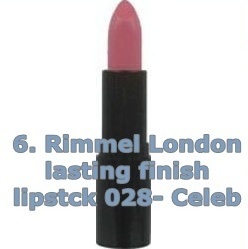 And on the otherhand, I had a Rimmel lipstick that I hated. I combined business with pleasure and turned lipstick into blush! Que acham?/ What do you think? Yes I have tried it at least five times. It doesn't feel sticky at all if you apply it directly after applying the foundation. If you apply it on dry skin it will look horrible and won't slide at all! It depends if the lipstick is creamy or not so much. Mine isn't creamy enough to apply with my fingers so I apply it with a buffing brush and it looks so natural and fresh on my cheeks!